Rice is the most popular grain consumed globally. 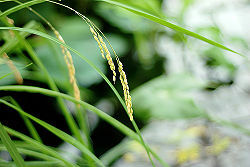 It comes from the genus Oryza found in the grass family Poaceae. It is the most diverse grain grown, making it so you can have it with almost any meal. It is grown all over the world, but survives best in areas that have high rainfall. Not only is rice used for consumption but it can also be used for medical reasons and in some areas of the world art. White rice is the kind that we all have become most accustomed to eating, but there are over seven thousand different species that are grown throughout the world. All Oryza plants have the same basic anatomy which consist of tillers, roots, stems, nodes, internodes, leafs, leaf blades, leaf sheaths, leaf collars, panicles, and flag leafs. In every species, all of these parts are located and shaped differently but to truly be rice, it must consist of all the above. There are many more parts, however, that are included within the plant. Within each panicle there are flag leafs, pendulces, rachis, primary branch, rachilla, and spikelets. A spikelet is the ultimate and congested inflorescence branch of the grasses. With that, it too has a lot stored inside of it, such as, pedicels, rudimentary glumes, rachilla, sterile lemmas, florets, lemmas, paleas, awns, the stamen, the anther, filaments, the pistil, the stigma, and the ovary. Based on that we can tell that the spikelet is where the reproduction of this plant takes place. For such a tiny plant it has so many complicated, but necessary parts that make the plant live and grow. 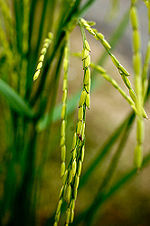 Rice is reproduced sexually through two steps, meiosis and fertilization. Meiosis is when the forming of haploid spore and gametes occurs. It is characterized by a single section of premeiotic DNA that replicates and then it’s followed by two non stop segments of chromosome segregation. An essential part of meiosis is called homologous recombination, that is when new haplotypes are generated by shuffling alleles. Fertilization, on the other hand, is obtained by the mixing of two gametes and results in new genotypes of diploid cells called zygotes. 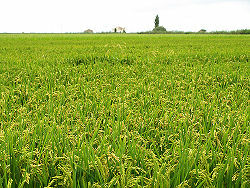 Rice can also be grown through farming. To grow rice, the fields have to be flooded, completely, with water because it takes so much for the rice to grow. After the seeds are soaked in the water is when they are ready to be planted. It takes about three months to grow and it must be harvested at the right time. If too early it doesn’t cook well, but if too late the seeds fall off when picked. This page was last modified on 1 June 2010, at 20:55.